The Humber Bridge has been chosen as the location for the first site visit of the new president of the world’s leading health and safety body. 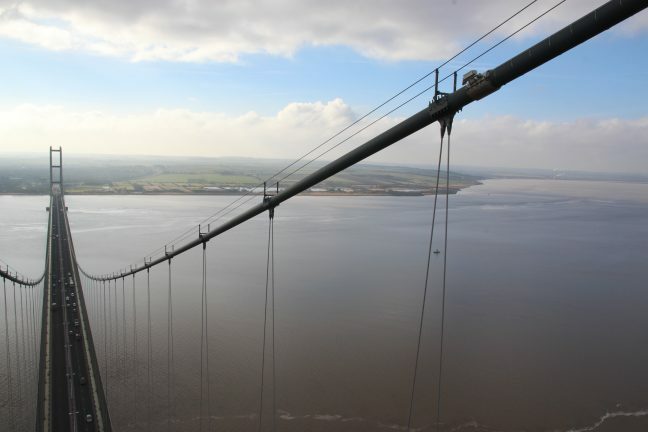 Civil engineers across the Humber are being set a special bi-centenary challenge to mark the anniversary of their professional body – pitch an idea in 200 seconds at the setting of one of the most impressive engineering feats ever. The Institution of Civil Engineers is celebrating its 200th anniversary in 2018 and has chosen the Grade 1-listed Humber Bridge as the backdrop for its milestone challenge, called Pitch 200. The competition will be held at the Bridge Board headquarters in Ferriby Road, Hessle, East Yorkshire on Tuesday 27th February, 6pm, when the candidates will present their ideas to a panel. The winner of Pitch 200, organised by the Humber Civils Network, will progress to the Yorkshire regional competition in York on 25th April 2018. As one of the four core national activities for ICE 200, this competition is an opportunity to show the general public how civil engineers transform lives directly, to encourage the next generation into the profession. Pitch 200 draws on engineers’ creativity to demonstrate a particular aspect of civil engineering to a public audience. Members at every level have the opportunity to submit a presentation in the weirdest, wackiest and most unconventional way using anything at their disposal to explain their chosen idea. Entering the Pitch 200 gives a chance to promote civil engineering as an exciting industry to the public; develop skills and confidence in public speaking; and become an ICE Regional Ambassador for 2019. Initial entries are by a 60-second video summary of what the full presentation would be, and can be based on personal work, area of expertise or another aspect on civil engineering. It can be adapted from project reports, university/employment research papers or something entirely new. Penny Marshall, the ICE’s regional director for Yorkshire and Humber, said: “No one knows civil engineering better than those on the ground practising it, that’s what makes these talks so fascinating. The winner of the Humber regional heat will also be given a VIP tour of the Bridge. 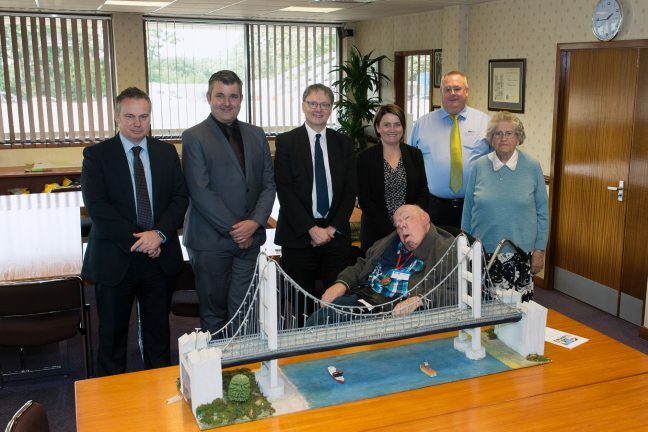 The Humber Bridge Board has paid tribute to the memory of a North Lincolnshire man whose passion for the bridge led him to create a large model, which was donated to the Humber Bridge team. Roly Chafer of Barnetby passed away at the age of 88 earlier this month. The offer to donate the model, which he built in 2000, came about because he moved to smaller accommodation and his family was worried that it would have to be thrown away. The model was made mainly using matchsticks. Mr Chafer offered his prized creation to the Humber Bridge Board and paid a visit in 2017 to present it to staff, who were delighted to accept it. The Humber Bridge Board made a donation of £50 towards Lindsey Lodge Hospice at Scunthorpe in memory of Mr Chafer, whose funeral was on 19th January. Magistrates in Hull have fined daredevil BMX rider Ryan Taylor for climbing the Humber Bridge without permission. Taylor was part of a group of men who scaled the safety barrier at the Barton end of the Bridge in May last year, and illegally walked up the cables to the top of the south tower. In a hearing held on Friday 12th January, magistrates fined Taylor £400 and ordered him to pay £125 costs for breaching the Humber Bridge’s byelaws. Taylor, a professional BMX rider who hails from Walsall in the West Midlands, did not attend court for the hearing. The case came about after the Humber Bridge Board brought a private prosecution. Dr Kevin Moore, Chief Executive of the Humber Bridge, said the Board was now looking into the possibility of taking action against other individuals. Taylor and the other men scaled the Bridge without harnesses or other safety equipment in the early hours of Monday 15th May 2017. The men took videos and pictures of themselves at the top of the Humber Bridge which they later posted on YouTube and other social media channels. They fled the Bridge after being spotted by security cameras at the top of the south tower. A keen amateur photographer from East Yorkshire has become the first winner of #YourBridge – a competition seeking to discover the best images of the Humber Bridge. 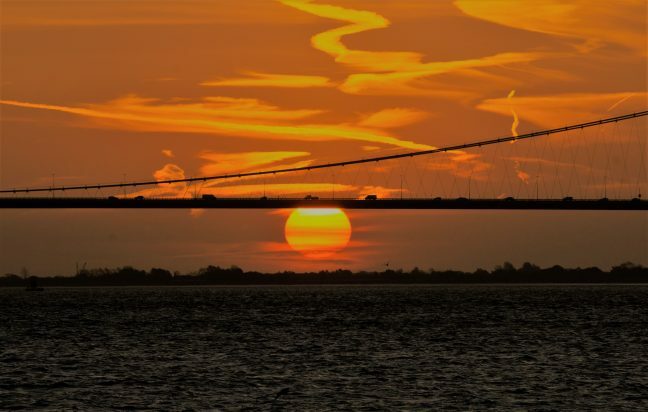 Mark Thompson, an IT worker with Hull-based communications company, KCOM, was voted January’s winner by staff at the Humber Bridge, for a spectacular picture of the sun rising behind the Bridge. The image, which was taken in October 2017, will be the banner image on the Humber Bridge Facebook page for the remainder of January and will feature on the Humber Bridge’s website. The competition is supported by Hilton Photographic of Hull and London Camera Exchange, High Street, Lincoln. Mark (42) from Hull, said being the first #YourBridge winner was ‘fantastic news’. He said: “I love taking photographs of the Humber Bridge as it is such an iconic landmark. “The photograph was taken at North Ferriby in October 2017. It just looked like a normal sunrise but then the distant clouds started to change and appeared like brush strokes. Competition organiser Tony Barker, the Bridge’s Communications Manager, said there had been some stunning entries for January, but Mark’s photograph had really stood out. He said: “The theme for the month was sunrises because at this time of the year, with the sun so low in the sky, we have some fantastic sunrises. #YourBridge will be running throughout 2018 with a different theme each month, which will include events, nature and more weather. The February challenge is to send in images of mist around the Bridge. Please submit your landscapes by 4th February 2018 to competition@humberbridge.co.uk. 7. Entrants retain full copyright of their images but grant licence to the Humber Bridge Board to use to promote the #YourBridge project, for general promotional purposes and in a charity calendar. 8. The images do not have to have been taken in 2017 or 2018 but can be great images which you may already have. 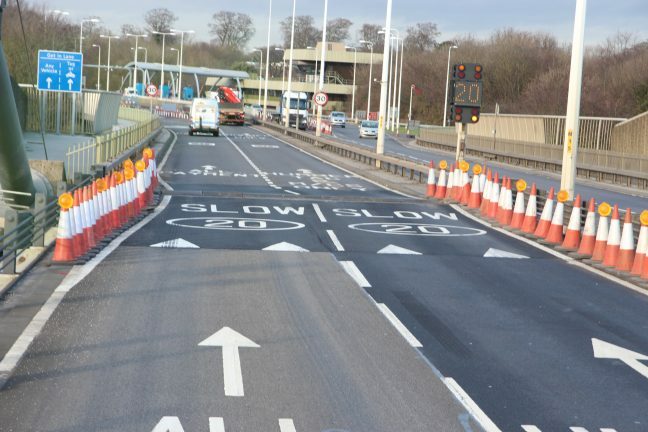 Motorists are reminded about lane closures and contraflows which may affect journey times across the Humber Bridge from this month as essential engineering work resumes. The scheme to replace the expansion joints at each side of the 1.4-mile long bridge will continue until April 2018 and will involve the use of temporary ramps to enable commuter traffic to use both lanes in each direction. The work, which started in December 2017, will re-commence at 7pm on Monday 8th January with overnight working on weekdays until 6am, and throughout a number of weekends until the works are complete. The work is being carried out with lane closures to ensure that the safety of the public and workforce is maintained at all times. Motorists with HumberTAG accounts will need to use the toll booths during these periods and all drivers are urged to allow extra time for their journeys, as there is a speed restriction of 30 mph across the bridge and 20mph at the ramps. For further details on the Humber Bridge, visit humberbridge.co.uk where details of the latest information about the status of crossings can be found. For the latest messages, the public can follow us on Facebook and Twitter. 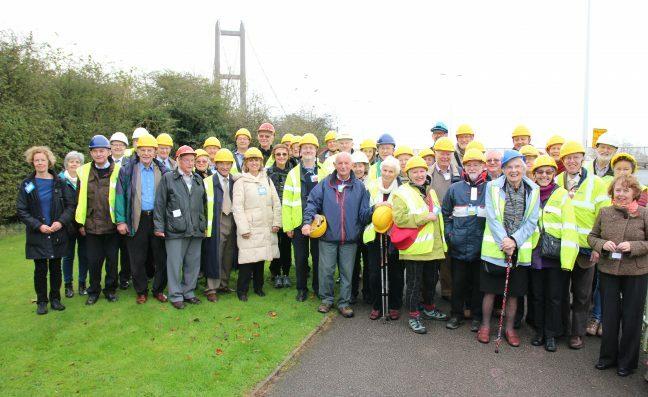 Some 26 retired engineers who helped construct the Humber Bridge in the 1970s returned to the banks of the Humber for their first reunion in November 2017. Many of them had travelled long distances to be part of it, including one man who came from Australia when he learnt of the reunion plans. The group were treated to a tour of the Bridge, including a visit up to the top of the Hessle Tower and down into the Hessle Anchorage. The Lord Mayor of Hull, Councillor John Hewitt, hosted a civic reception at the Hull History Centre before tour guide Paul Schofield led the delegation on a city centre walk. An evening reception completed the day where one of the speakers was the then Chairman of Hull 2017, the journalist Rosie Millard. The event was jointly organised by Douglas Strachan and Jerry Gurney.